Coming off the band’s appearance at Europe’s biggest biker city event the Hamburg Harley Days Festival in Hamburg, Germany (on Friday, June 23rd) it is announced The Dead Daisies will return to the U.S. for 3 major U.S biker events and performances that follow up the band’s debut Full Throttle Saloon appearance during the Sturgis motorcycle rally last year. 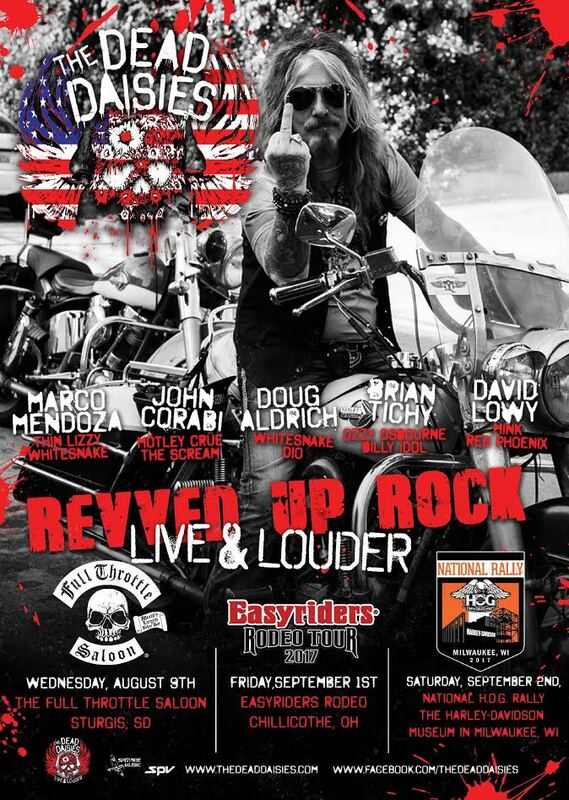 In addition to these 3 colossal bike events, The Dead Daisies are working with 12 of the largest Harley-Davidson dealers in the country as part of their Rock N Ride promotion to support their Dirty Dozen National Tour. This promotion will enable Harley-Davidson owners and customers in the appearance markets to have the chance to win tickets to the bands shows and a chance to meet the band. And with this sort of sound, it makes perfect sense for the band – which features members of Motley Crue, Whitesnake and Thin Lizzy – will be performing songs from their highly- anticipated, sweat drenched roof-raising new album, ‘Live and Louder’ (out now!) at several U.S. biker-events this summer. The band features in their ranks some of the finest rockers on the planet, among them one of the premiere lead guitarists of this day and age, Doug Aldrich (Whitesnake, Dio). He completes a powerhouse line-up consisting of charismatic singer John Corabi (Mötley Crüe, The Scream), bassist extraordinaire Marco Mendoza (Thin Lizzy, Whitesnake), drummer to the stars Brian Tichy (Ozzy Osbourne, Foreigner) and bringing the thunder from down under, Australian rhythm guitarist and founder David Lowy (Red Phoenix, Mink). Rock & Roll is indeed alive & well – We’re an American Band!!! Previous Previous post: Saliva Prove They Still Have The Metal !